The Honda CR-V earned the title of 2018 Motor Trend SUV of the Year® for a multitude of reasons. * Motor Trend experts praised everything from its design and engineering to its cargo-carrying capabilities inside this comprehensive vehicle. Though its smart looks and reliable performance tend to get most of the attention, the Honda CR-V’s technological prowess shouldn’t be overlooked — from infotainment to safety, the CR-V is an intelligent SUV for an intelligent driver. No matter which CR-V trim you select, you’ll benefit from the latest version of Honda’s 7-inch Display Audio System. Across the CR-V range, the Display Audio System offers HondaLink™ Next Generation, which provides easy access to your favourite apps and compatibility with Apple CarPlay™ and Android Auto™. At the top of the line, the CR-V Touring adds a Honda Satellite-Linked Navigation System™ with bilingual Voice Recognition, which makes it more convenient to get to your desired destination. The Honda CR-V LX and LX-2WD are equipped with a four-speaker, 160-watt AM/FM audio system that offers MP3 and Windows Media® Audio playback capability. The sound only gets better the further up the lineup you go: The CR-V EX upgrades to 180 watts and six speakers, and the CR-V EX-L adds two additional speakers for even greater sound quality. The CR-V Touring ramps the audio experience up even further with a nine-speaker, 331-watt AM/FM Premium audio system that includes a subwoofer. 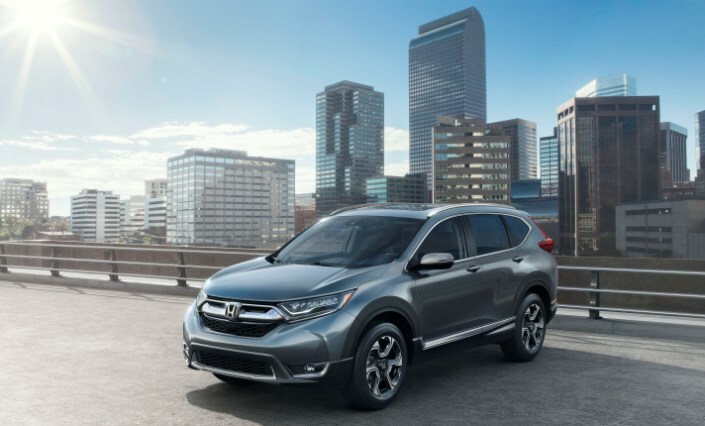 Safety is one of the Honda CR-V’s core values, as evidenced by standard features including Hill Start Assist, Vehicle Stability Assist (VSA®) with Traction Control, LED daytime running lights, and projector-beam halogen headlights with auto on/off. From the CR-V LX-2WD up, cutting-edge Honda Sensing™ Technologies including Collision Mitigation Braking System™ (CMBS®), Forward Collision Warning (FCW) system, and Adaptive Cruise Control (ACC) with Low-Speed Follow (LSF) add peace of mind when you need it most. If you want a modern SUV that delivers the latest in connectivity, entertainment, and safety technologies, look no further than the CR-V — available at St. Albert Honda. *The 2018 CR-V has been named Motor Trend’s SUV of the Year® thanks to its impressive cargo space, efficient fuel economy and Honda Sensing® safety and driver-assistive technology standard on EX and higher models.